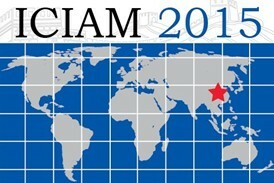 Since ICIAM 2015 is coming in one month and the department which is responsible for issuing the Invitation Letter of Duly Authorized Unit will begin summer vacation on July 18, the deadline for invitation application is July 8 (Beijing Time). Please apply for a tourist visa after that. Attendees are advised to consult the nearest Chinese diplomatic mission for details. Please visit the Chinese Embassy Official Website: www.visaforchina.org for more detailed information about the Chinese Embassy (Consulate General/Consulate/Office) close to your location. If attendees apply for a tourist visa, which will be the best visa type to obtain as long the registrant does not have plans for conducting extensive business other than attending the conference and sightseeing, an official visa invitation letter will not be needed from ICIAM 2015. Kindly note that it takes two to three weeks to issue an official invitation. As a result, please take it up as early as possible. Meanwhile, an official invitation provide a maximum of 11 days (from August 7 to 17) to stay here. A scanned file of the applicant's passport is necessary. If you need to stay in Beijing beyond the period, please apply for a tourist visa. The hard copy of the official invitation letter will be sent by post for free. A requester should disburse USD 20 for express fee at onsite registration desk.